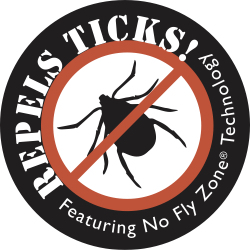 We attend many shows and events throughout the year to promote and sell our No Fly Zone products and our number one question is “What is Permethrin and how does it repel ticks?”. Hearing this question over and over is the motivation that keeps me on this guerrilla marketing campaign to spread information about Permethrin to the public and help prevent the spread of Lyme Disease. To answer this common question, Permethrin is a synthetic compound that has the same properties as the Chrysanthemum flower. Both repel biting insects but Permethrin is a pesticide created for commercial use. The No Fly Zone fabric is permanently treated with Permethrin by “baking” it onto the fibers of the fabric when woven with the company’s proprietary treatment. The resulting fabric is effective in repelling ticks and biting insects up to 70 washings and does not come off on your skin or your dogs skin, even when wet. Permethrin treated fabric is EPA registered and recommended by the CDC to protect against insect borne illness. Permethrin treated fabric is commonly used in commercially-sold hiking and hunting gear manufactured by L.L. Bean, REI, and Dog Not Gone/No Fly Designs among other similar companies. Also, in July 2010, the Army began issuing factory-permethrin-treated, flame-resistant, combat uniforms to all deploying Soldiers after extensively testing the treated fabric to ensure the insect protection is effective for the life of the uniform. Dog Not Gone and No Fly Designs are proud to use No Fly Zone fabric in all their products to help people repel biting insects and prevent insect borne illness. All our products are Made in Maine with this Made in USA fabric. For more information, please check out the Insect Repellency page from Burlington Fabrics. Start protecting yourself and your family. Shop Permethrin-treated Clothing.